In order to make intelligent choices about energy it’s important to understand what energy is. Surprisingly, energy is not easy to define; and you are likely to find different definitions in different textbooks. A useful definition for energy is “that which makes things happen.” Can you see energy? Actually, all you can see is energy, because light itself is energy. Our other senses (touch, hearing, taste, and smell) also depend on the interaction of energy with our bodies. Energy is a part of every moment of our experience. See if you can apply this definition in the following investigation. Use magnets and coils of wire to generate electricity. A number of different answers are possible for where you can find energy in the system consisting of you, the coil, meter, and magnet. Certainly there is energy in the movement of your hand. There must also be energy in the coil while it is being moved near the magnet, because it makes the needle in the meter move. In 1831, Michael Faraday connected a loop of wire to an electric meter. He noticed that the pointer on the electric meter jumped when he moved the coil of wire near a magnet, just as yours did in the previous activity. This discovery led to the invention of the electric generator, which produces nearly all of the electricity that lights our cities and powers modern industry. What happens inside the coil of wire when you move it near the magnet? One way to think about what is happening is to visualize tiny particles—called electrons—that are free to move through the coil of wire. The electrons are pushed and pulled by the magnet. When these electrons move in the wire, they cause the needle in the meter to move. The flow of electrons through the wire is electrical energy, or simply electricity. Notice that neither the magnet nor the coil alone can produce electrical energy—it takes the movement of the coil by your hand to produce the electrical energy. 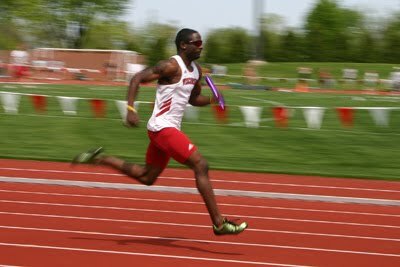 Motion energy is called kinetic energy. In the previous activity you converted kinetic energy into electrical energy. Let’s look inside an electric generator and see how it converts kinetic energy to useful electrical energy. Keep in mind that although it looks complicated, an electrical generator works on the same principle as the system you already explored—you, the coil, meter, and magnet. Magnets turn up often in modern life. You find them stuck to refrigerators, in telephones, televisions, motors, speakers, recording tape, credit cards, and bank cards. Magnets seem to act like magic. All magnets have North and South poles that attract each other, but South poles repel South poles, and North poles repel North poles. Scientists use the concept of a field to describe the force a magnet can exert in the space surrounding it. 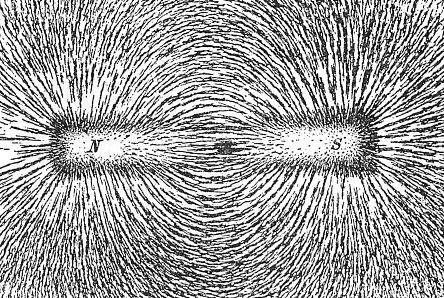 A magnetic field is invisible, but flakes of iron around a magnet will line up to show the direction of the field lines. You may be familiar with a small electric generator used on bicycles to power a light. The generator is attached to the bicycle so that peddling turns not only the bicycle wheel, but also turns a coil of wire inside of a magnet. The work of peddling the bike produces the electricity to power the light. Here’s how it works. Inside the generator, a magnet creates a strong magnetic field. A coil of wire called the armature coil spins in the magnetic field. As the wire moves through the field, the electrons in the wire are forced around the coil by the magnetic field. During one half of a turn the electrons are pushed one way and during the other half of the turn the electrons are pushed the other way. This pushing of electrons is how the generator produces electricity. In order to get electrical power from the generator, the armature coil must be connected to cables. There is one small difficulty. The armature is always turning. If the cables were connected directly to the armature coil they would get twisted very quickly. Instead, the wires at the ends of the coil are connected to slip rings on the shaft of the armature. The cables that carry current from the generator are connected to brushes that rub against the slip rings as the armature turns. Can you find the slip rings and brushes on the diagram on this page? The diagram of “An Electric Generator” is simplified to show the principles of a generator. Here are some ways a real generator is different from the one in the diagram. 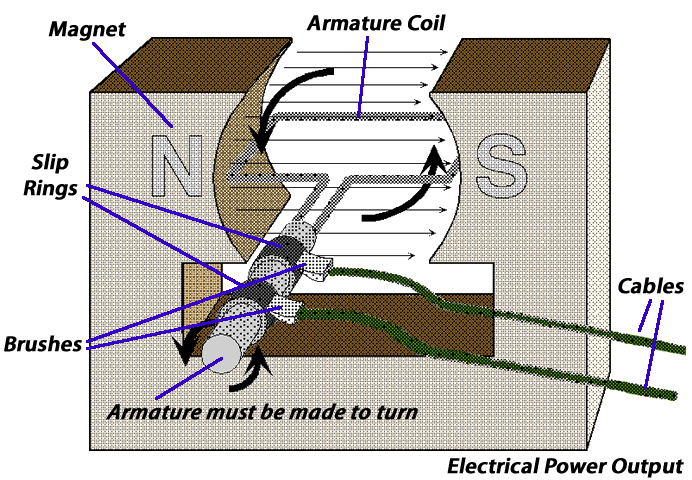 •	The diagram shows a single loop of wire in the armature coil. In the coil of a real generator the wire is wrapped around many times. •	The armature coil in a real generator is also wrapped around a core of iron to intensify the magnetic field. •	The armatures of most large generators have more than one coil, each one in a different position. That way one generator can act as several separate sources of electrical power. •	The magnet in a large generator is an electromagnet. It consists of coils of wire, called exciter coils, to create a large magnet and the large magnetic field. Can you force a coil to move by putting electricity into it? We use a lot of energy-related terms in everyday language. That sometimes makes it difficult to understand the precise way these words are used in science. For example, compare the meaning of the terms work and power in these two sentences. What is the different meaning of the word in each case? (1) Leonardo’s painting “Mona Lisa” is such a magnificent work it has the power to move people to tears. (2) The work of peddling the bike produces electricity to power a light. Work refers to the amount of energy expended when a force is exerted for a certain distance. For example, twice as much work is done if you peddle your bike twice as far. Twice as much work is also done if you push twice as hard on the peddles for the same certain distance. Power is the speed, or rate, at which energy is converted from one form to another. A ten-watt bulb in your bicycle headlight converts electricity into light energy twice as fast as a five-watt bulb. It is therefore important not to put too high a wattage bulb into your headlight, which will require more electricity to stay lit than a lower wattage bulb, so you don’t have to work so hard to keep it lit. Energy is defined in this book as that which makes things happen. Work is a kind of energy; so is light and electricity. Potential Energy is one more kind of energy you need to know. Potential is another word that has different meanings in everyday language. We can talk about someone’s potential—meaning what they could achieve. In science, potential energy is stored energy. There are many different kinds of potential energy. When you pick up a stone you are increasing its potential (gravitational) energy. Let go and it turns into kinetic energy as it falls. Batteries hold potential chemical energy. Connect the terminals of a battery with a wire and light bulb—you turn some of the battery’s potential (chemical) energy into heat and light energy. In the next activity you’ll turn potential chemical energy into kinetic energy. When you measure the current from a battery, the reading on the meter remains steady. Electrons flow in one direction through the wires pushed by a steady force. That kind of current is called direct current or DC. In the Lab Investigation “Doing Work to Create Electricity,” when you moved the wire in the field of a magnet, its position was changing and the current was rising and falling, or even reversing direction. Producing DC with magnetism is a tricky job, but it is fairly simple to use magnetism to generate a current that alternates back and forth in a regular way. This is called alternating current, or AC. In an AC power system the electrons do not flow very far before they stop and flow the opposite way. Electric power from a standard outlet is AC in which the current reverses direction 60 times per second. Energy is never created or destroyed. When a battery runs down, people speak of energy being “used up,” but “used up” energy has not disappeared. It has been converted from one form of energy to another. This is called the Law of Conservation of Energy. This is one of the most important ideas in physics, and we will see it again later in this book. When we use energy for our own purposes, we are really transforming energy from one form to another. If we trace back these energy transformations to their sources, we find nearly all the energy people use to heat and light their homes, to run their cars, or produce the billions of products we use everyday, comes from stored chemical energy—energy stored in the ground for millions of years. We’ll learn about these sources of energy, called “fossil fuels,” in the next chapter. Identify types of energy and ways they transform into one another. To see how this equation is applied, imagine a stalled car and you are trying to push it to the side of the road. The harder you push—the more force you exert—the more work you do. The further you push the car—the greater the distance the car moves—the more work you do. Oddly enough, however, if the car is too heavy, and no matter how hard you push you cannot get it to budge, the work done will be zero (W = F x 0 = 0). Again, consider the stalled car. If you don’t have enough chemical energy stored in your body to get the car moving, you could ask a passing truck to use its kinetic energy to do the work needed to get the car to the side of the road. A common unit of force is “pound.” You have to exert five times as much force to lift a five-pound object as a one-pound object. In science, the most common unit of force is the newton, in honor of Sir Isaac Newton who made important discoveries about gravity in the 17th century. One newton is equivalent to a force of about .22 pounds. How much work does it take to lift a book from the floor to a shelf at a height of two meters, if the book weighs the equivalent of 0.25 newtons? In the case of a crane lifting a concrete slab, energy from the gasoline in the crane’s engine is transformed into potential (stored) energy of the concrete slab suspended at a great height. Should the cable break, the potential energy would be converted to kinetic energy (motion) as the slab speeds toward the frightened workers below. What force would be doing the work on the slab as it falls? In the formula for work, if force F is in newtons and distance D is in meters, then the units of work W is in “newton-meters.” A newton-meter is also called a joule, named after James Prescott Joule, who was the first to show experimentally that work could be transformed into heat energy, and visa versa. Work is done when an engine moves a car. Work is done when the brakes stop the car. Work is done when electrons are pushed through the filament of a light bulb. Is reading this page work? Well, you could say “No,” since there is no force applied and the book remains stationary. On the other hand, reading and thinking do involve work since they cause electrons to move in our brains. 2.3 If 1 newton = .22 pounds, what is your weight in newtons? 2.4 How much work does it take for a newlywed husband to lift his bride one meter to carry her over the threshold of their new home, if the bride weights 500 newtons? 2.5 If an automobile has expended an amount of energy equivalent to 1,200,000 joules of work, and to propel the car the engine is exerting a force of 600 newtons, how far has the automobile traveled? More than 2,000 years ago, the Greek philosopher Thales (624-546 BC) wrote of how the substance amber attracted light objects when he rubbed it. William Gilbert (1544–1603) discovered that a variety of other substances did the same thing. He called these substances “electrics,” from the Greek word for amber, elektron. Have you ever rubbed a balloon on your hair so that it would stick to things? If so, you were giving the balloon an electric charge. There are two opposite types of electric charge called positive and negative. Most matter is made of particles with positive and negative charges in equal amounts. Equal amounts of positive and negative charge give a total charge of zero. When you rub a balloon on your hair, particles that have a negative charge move from your hair to the balloon, and the balance of charge is no longer zero. The balloon is now negatively charged. What about your hair? What kind of charge does it have? Benjamin Franklin (1706–1790) was the first to apply the words “positive” and “negative” to electricity. His work was mainly in the area of static electricity, the properties of charges that are not moving. Static electric forces follow these rules: positive charges repel each other, negative charges repel each other, and positive and negative charges attract each other. Electric force ranks as one of the basic forces in the universe, along with gravity and nuclear forces. Soon after the time of Thales, the idea arose that if you cut a chunk of matter into smaller and smaller pieces you would reach a point where the pieces could no longer be cut. Their word for such a small particle was atom, meaning “cannot be cut.” Today, the word “atom” is still used for the smallest building blocks of elements, but atoms are made of even smaller pieces—protons, neutrons, and electrons. Protons and electrons have equal and opposite charges, protons being positively charged and electrons being negatively charged. Neutrons have no electric charge. In each atom, the nucleus is made of protons and neutrons, and is fixed in a certain position. Electrons are far lighter than protons and neutrons. They surround the nucleus and can be pushed around more easily. Quite simply, electricity is the movement of charged particles. In most solids, it is the movement of the electrons that is electric current.